At one point, the Orange reached No. 12 in the AP Poll, which was their highest ranking since 1996. 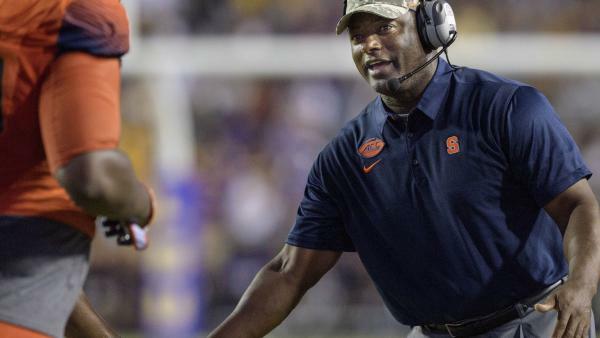 By no means is it easy climbing out of the last place in a Power 5 division, but looking ahead to 2019, the next step Syracuse wants to take is even more difficult. The difference between good and great programs is minimal and yet going from a 10-win team to a championship level squad is the hardest leap to make. But the stars may be lining up just right for the Orange in 2019. As is the case for many teams in the ACC, Syracuse has questions at quarterback. Eric Dungey graduated, and while he dealt with injuries throughout his career, Dungey will be remembered as one of the greatest Orange quarterbacks of all time. His mobility and accuracy was a perfect match for Babers’ system, and he took full advantage in his senior season. Dungey missed the end of a few games because of injury, but he started all 13 contests and completed 60.9 percent of his passes for an average of 7.7 yards per attempt. He also rushed for 754 yards, accounting for 33 total touchdowns and nine interceptions. Replacing Dungey’s production and leadership will not be easy and is the biggest hurdle the Orange face this season. But Syracuse should be very confident last year’s backup signal caller Tommy Devito is ready. Devito received significant playing time against Florida State, North Carolina and Notre Dame because Dungey left with injuries versus each opponent. Against North Carolina, Devito led the Orange to an overtime victory, which briefly started a quarterback controversy towards the end of October in central New York. While facing Florida State and North Carolina, Devito shined, completing 22 of 35 passes (62.9 percent) for 325 yards, four touchdowns with an interception. He averaged almost 9.3 yards per pass against those opponents. But then against Notre Dame, Devito completed only 45 percent of his throws for 105 yards with zero touchdowns and two interceptions. He didn’t even manage to average 3.5 yards per attempt. That rough performance will be enough for experts to question whether Syracuse can insert Devito behind center and not skip a beat on offense. However, it’s also important to keep in mind the Notre Dame defense was one of the best in the country last season, and very few teams had much success through the air against him. Clemson and Vanderbilt were the only teams that were able to average more than 6.8 yards per pass, and the Irish defense allowed seven passing touchdowns while recording 12 interceptions during the regular season. It’s probably unfair to expect the Dungey to Devito transition to work so seamlessly anyway. As long as Devito can be serviceable, Syracuse is going to threaten to win 10 games again and maybe compete for the ACC Atlantic title. That’s because of what the Orange have coming back everywhere else on the field. Syracuse will have a stocked backfield to give plenty of support to its sophomore signal caller and plenty of experience on defense. Halfway through spring practice, the Orange have nine seniors slotted to start defensively. That unit benefited greatly in the turnover department last season. Syracuse forced 18 interceptions and recovered 13 fumbles, both of which led the ACC. Nationally, only Utah State and Ohio recorded more takeaways than the Orange. But as we’ve seen with other teams, including Miami in the ACC, the takeaway and giveaway categories can fluctuate greatly from year to year even with the same scheme and players. In addition to 31 takeaways, Syracuse only turned the ball over 13 times, giving the Orange the second-best turnover margin in the Power 5. Even with a veteran group returning, it’s hard foreseeing Syracuse repeating those numbers, especially with an inexperienced quarterback. If the defense can’t create great field position or should the offense place the defense in bad situations because of turnovers deep in its own territory, how will that change this team’s dynamic? It’s honestly one of the biggest question marks of the offseason. One thing that is clear, though, is Syracuse is capable of competing with Clemson, which means the Orange will have its shot of winning the ACC Atlantic. Syracuse beat Clemson, 20-17, in 2017 and nearly pulled off the upset again at Death Valley last season. This year, the Tigers return to the Carrier Dome, where Syracuse is 6-2 against ACC opponents over the last two years. Championship teams like Clemson are what keep programs like Syracuse from reaching the pinnacle of the conference. Louisville is the best most recent example in the ACC. The Cardinals were yards away from beating the Tigers in 2016 but failed to win and missed their chance at really making an impression on the national stage. If the Orange want to make that national impression, they need to beat Clemson. But their success against the Tigers the last two years is going to give the Orange a ton of confidence in that game -- even with a young quarterback. Syracuse’s biggest question marks are at quarterback and whether its defense can repeat its incredible year of takeaways. If either or both are answered, there’s reason to believe Orange football can take another step forward in 2019.